"iOS 6 is the worlds most advanced mobile operating system, and with nearly 300 million iPhone, iPad and iPod touch devices on iOS 6 in just five months, it may be the most popular new version of an OS in history," said Philip Schiller, Apples senior vice president of Worldwide Marketing. "iOS 6.1 brings LTE support to more markets around the world, so even more users can enjoy ultrafast Safari browsing, FaceTime video calls, iCloud services, and iTunes and App Store downloads." 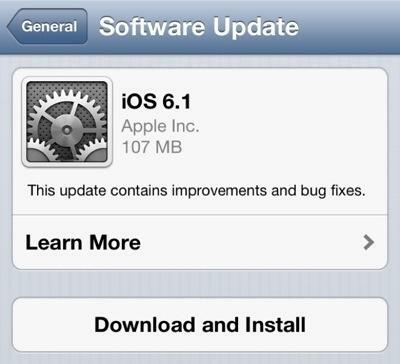 The release of iOS 6.1 comes just a few days after Apple issued one last beta to its development community. Apple did not identify that beta build as a "golden master" copy when it was provided to developers on Saturday  a rare weekend release necessitated by the fact that the previous beta was set to expire on Sunday.